Here are simple scalp scrub recipes using brown sugar and a carrier oil along with essential oils picked for their hair loving abilities. Exfoliating your scalp is just as important as exfoliating the rest of your body. Scrubbing the scalp removes excess oils and impurities. A scalp massage also improves the circularization and blood flow to hair follicles which can result in faster growing hair. And aid in the prevention of hair loss. This is also an effective and easy way to remove dandruff and product build up. And did we mention it feels great?! Why use Brown Sugar for a scalp scrub? Brown sugar washes right out of the hair with NO left over residue. Brown sugar contains molasses. Molasses are a natural humectant or moisturizer and leaves the hair really shiny. You can choose to just use plain DARK brown Sugar or you can get creative and add a carrier or essential oil to the mix. Dark brown sugar works best because the sugar grain is larger and won't melt as fast as regular sugar or even light brown sugar. So always stick with the dark kind. Put about 1 cup of dark brown sugar in a bowl. Leave this outside of the shower. You do not want any water getting in the bowl or it will melt the sugar immediately. Wet hair in the shower. 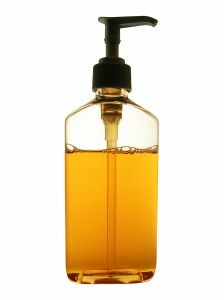 If you have styling products in your hair, apply a little conditioner to make hair more pliable then rinse. Take a heaping scoop of the scrub and apply to scalp with fingers, separating the hair to reach entire scalp. In circular motion, scrub the scalp with the mixture. Rinse well, then shampoo and condition hair as normal. Directions: Place ingredients in a bowl. If you are adding oil to your recipe, do not heat the oil as this will melt the sugar. Mix the ingredients and use right away. Just as a facial exfoliator removes dead skin cells from the face, a brown sugar scrub removes skin cells from the scalp. A wonderful, natural treatment for dandruff. Use this as a safe, effective way to treat cradle cap on children and babies.